Meghan Bailey - Pixie & Pirate Destinations *|* Wishes become memories. One dream at a time. Meghan Bailey is here to help you plan a magical vacation! Seeing my two boys. They make everyday so special. I wanted to be a Dolphin Trainer. I am the oldest. I have two younger brothers who both tower over me now. Handwriting. My handwriting is terrible and I have always wanted to be able to write prettier. I even tried to teach myself calligraphy but that didn’t work out. 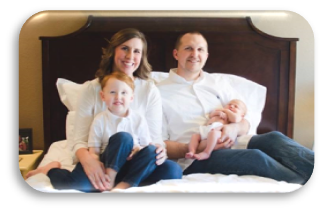 Meghan lives in Northwest Alabama with her husband, Trey and two sons, TJ (4) and Jake (4months). Meghan and Trey both grew up in the area and all of their family lives very close by. She is a stay at home mom, but she has a degree in Secondary Education from the University of North Alabama and tutors at risk students one day a week and substitutes at the local high school. Her family is involved in their local church and their community. She is the Director of the Sparks age group of Awanas at her church. Meghan and her husband took TJ to Disney World for his first time when he was 2 and has been once more since then. Jake will be going on his first trip at 10 months old. She can’t wait for her boys to grow up loving Disney as much as she did and still does. I would want to be Minnie Mouse. I used to practice signing autographs when I was little and since my name starts with an M, I wanted to marry someone who’s last name started with an M so my name would kind of look like Minnie Mouse’s. I would be Genie in Aladdin. A picture frame to display a picture from our trip. Magic Kingdom. I would dance all over the stage in front of Cinderella’s Castle. Then I would ride Seven Dwarf’s Mine Train over and over and over. How old were you were you first visited Walt Disney World? Request your Disney vacation quote - Be sure to select Meghan Bailey. as your preferred Dream Vacation Pixie!